Easy wear for day and evening and especially useful when travelling. 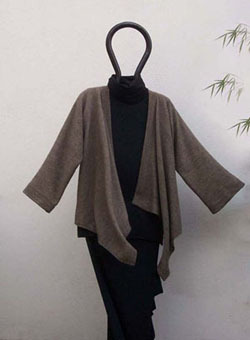 Very easy to knit by hand or machine, worked in one piece with only the shoulder seams to join at the end. The Yarn: 200 gram MILAN - Super Kid Mohair colour 31, at present there are 23 beautiful colours in stock. Machine: Standard gauge machine with Ribber. Hand knitting: Needle size 3 to 4 mm. TO ORDER the pattern and/or yarn please see below. 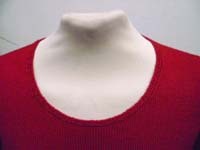 Very loose, soft folded turtleneck collar knitted on the circular for a perfect fit. 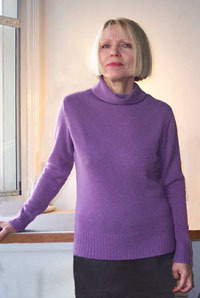 very low (purple), medium (white) very long (brown), however the low collar can be made even lower by simply knitting less rows. 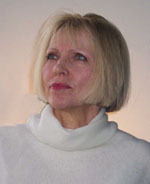 With a modern-day neck trimming and long set-in sleeves that gather into a narrow, with a single button cuff. M 57 - for machine knitting only at present. 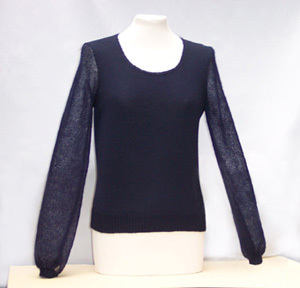 Version 2: for sleeves in the Main Quality - CARINO (not shown), with ribbed cuffs. 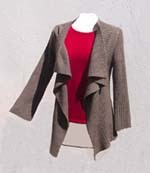 Smart, easy fit, edge to edge jacket in 2 x 2 rib. With set-in sleeves and draped front with no extra front bands. The Yarn: 400 gram ROMA - Extra Fine Merino Wool wound double on one cone. Finished seam along the decreases of the armhole. applied to many other ribbed texture. Small (8 to 10), Medium (12 to 16), Large (16 to 18) and include a sleeveless version as well as short and long sleeves. 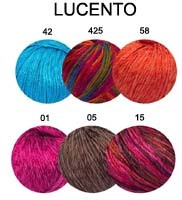 Yarn requirement: 400g ROMA wound double onto one cone for all sizes. To choose a colour please go to ROMA page. 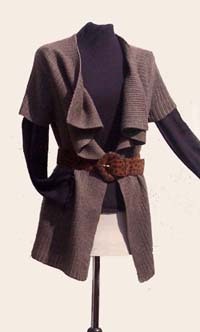 TO ORDER the pattern and/or yarn please see below..
Stocking Stitch Cardigan with double layered front band and optional yoke lace detail. The buttonhole is worked through the Ribbed Band and the Rouleaux Stocking Stitch Band. The Yarn: 350 [350, 400, 400] gram ROMA - Extra Fine Merino Wool wound double on to one cone. and at present only the machine knitting version is available. Machine: Standard gauge machines including Passap/Pfaff and Singer. Yarn requirement: 350g for small and medium £22.90, 400g for large and extra large £25.90, wound double onto one cone. 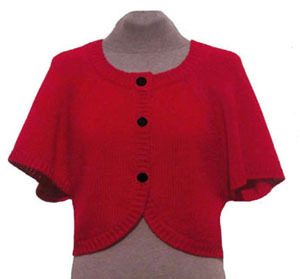 Pattern: Available for machine knitting with STEP-BY-STEP instructions at £6.50, for hand knitting at £3.50. Needle size: 4.5 mm (7) to 5 mm (6). Modern silhouette with effortless style, in stocking stitch with rib trimmings. The Yarn: 400g ROMA - 100% Extra Fine Merino Wool or 450 g CREMA - Wool/Silk blend. The Pattern: In four sizes. For standard gauge machines. showing the exact needle positions. buttonhole (see Step 5 on right). The Yarn: 450 g Alpaca/Wool blend. This particular quality is now sold out, however with small adjustments it can be substituted with 650 gram ROMA - 100% Extra Fine Merino Wool treble (three strands wound together). 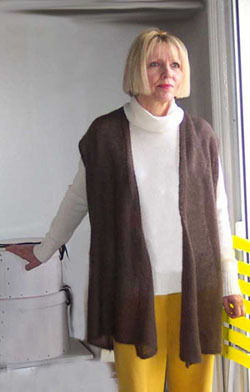 It can also be knitted in ZADIG the fine Alpaca Blend. approximately Tension 5 on a standard gauge machine and Needle size 2.75 mm to 3.75 for hand knitting. is in four sizes - Small [medium, large, extra large]. 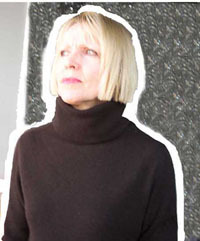 The machine and hand knitting pattern includes the instructions for the straight and gathered sleeve variation as shown.